Today we met two pediatricians, Rebecca Johnson-Paben and Sarah Green, who talked about what kicked off their interest in medicine, the steps they took in order to go into medicine, and their current specialties and activities in the medical field. They spent a lot of time answering questions because there were a significant amount of hands raised! The speakers also asked the students what they could do to be better providers. There were a lot of responses, but in essence the students voiced how they wanted equality among patients and the time to be taken to really understand the patient and their needs. Afterwards, we measured the impact of exercising on one's heart rate. The girls learned how to measure their own heart rate and graph the changes after various activities like walking or sprinting. During this meeting, our members had the chance to meet Michelle Mellenthin, a Biomedical Engineer and and Post-Doctorate Researcher at CU Denver’s Smith Lab. The group learned how to spot diseased cells in mice and to fold their own origami microscope to observe various samples from the lab. Michelle spoke about her background and current plans in biomedical engineering. It ranged from her volunteer project done in a developing country to create a filtering system for a village's river to innovating pieces that aid in surgical processes, specifically airway surgeries in her case. The participants appreciated Michelle’s talking about intersections between jobs, about how people see Engineers as math and physics people, but that is interconnected to other fields, such as medicine. Today we had the pleasure of meeting Justine Henderson, a Denver-based designer and photographer. We got to hear her inspiring story and were introduced to some of her amazing work. Now we will explore the intersection of graphic design and technology first-hand, using digital design tools to create our very own business cards! Sign up at canva.com using your school Google account. You can ignore all the bluish-purple pages that appear after you first sign up. Just move on to the next step. After signing up, click here to open the Beginner's Challenge. This will show you how to use Canva’s tools and features. Want actual copies of your business card? 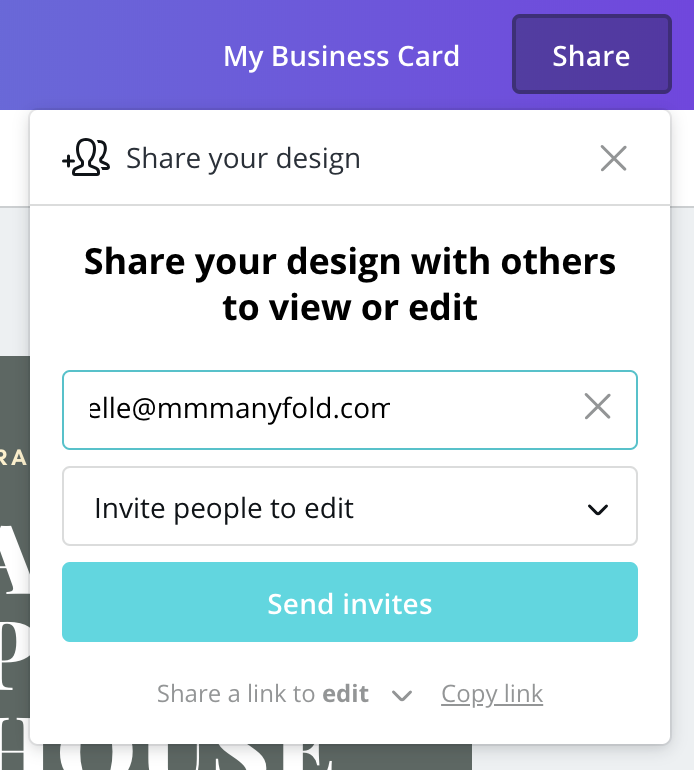 Click Share at the top and enter this email address: elle@mmmanyfold.com (that’s 3 m’s). You may continue to work on your design until Sunday, Nov. 25. After that Michelle will print the cards and bring them to our next meeting in December! Today we met Lynn Riemer, an experienced forensic chemist, illicit drug expert, community advocate and prior member of the North Metro Drug Task Force in Colorado. We learned about the major role chemistry plays in solving crimes, by experimenting in our own version of a crime lab. In order to correctly identify an unknown “mystery powder” we first observed reactions between commonly known powders and various liquid solutions. Using the same liquids on the mystery powder, we were able to determine its contents based on the earlier observations. Julianna Oviedo is a third year undergraduate at the University of Colorado Denver. She is majoring in Biochemistry and is on a pre-medicine track. She is currently researching in two different labs – one dealing with growing and treating prostate cancer cells under different conditions, and the other working with proteins involved in insulin secretion. Julianna has interned at multiple STEM-related facilities such as Lockheed Martin and the University of Colorado Hospital, and she hopes to encourage more girls to pursue STEM pathways as well as see them develop into confident women who aren’t afraid to fulfill their aspirations.